BTMC New Govt job circular Application Form 2017 Download Available. bangladesh textile mills corporation job circular 2017 Open. Government btmc job circular 2017 has been published By The Bangladesh textile mills corporation (btmc) Authority. If bd job Candidate Want To Apply Now In www.btmc.gov.bd application form Notice, Then Visit Their Official Website. 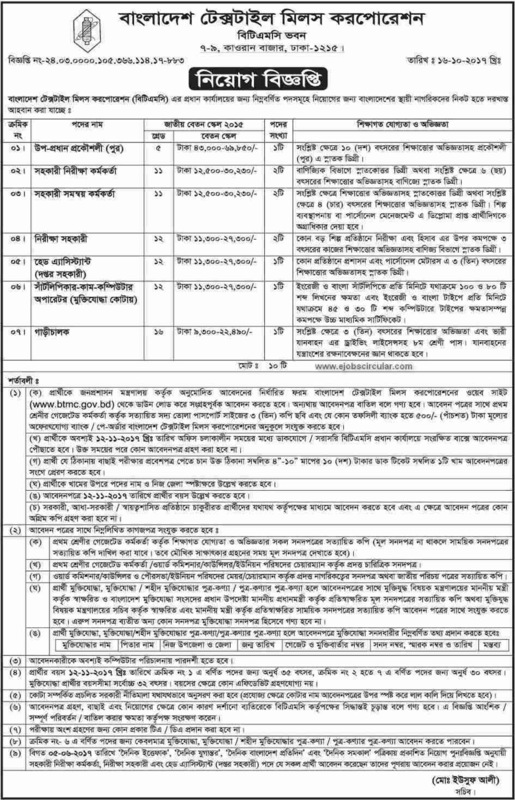 You Also See www.btmc.gov.bd New job vacancy Notice In Edujobbd.com. Its Bd Leading Job Advertisement Provider 24 online portal. Check more Here, BTMC job circular Admit Card offer, Govt BTMC Jobs Exam Results Date And btmc New Govt job circular Application Form 2017 Download. Organization/Sector Name: Bangladesh textile mills corporation (BTMC). Publication Date: 16 October 2017. BTMC Last Vacancies Positions: Computer Operator, Superviser etc. Required Experience: See the Circular for your Skilled Position. Salary: 9,300 – 69,850 Taka. Application Fee: See BTMC Job Circular 2017. Source: BTMC official website / Online Job Newspaper Daily Jugantor.